I took this picture with my Motormarine II camera with a Sea & Sea flashgun and Fuji Sensia 100 film. The tiger sharks are incredible creatures to work with. 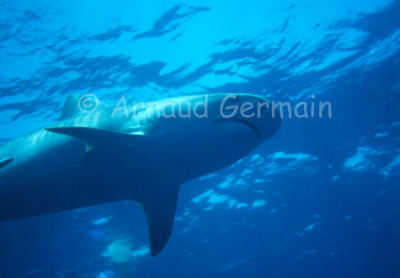 They are big-the one on the picture is around 4.5 metres- but they are really gentle and cautious. The first time you are in the water without a cage, with a lot of bait in the water and in company of such feared predators is quite surreal. Once your confidence grows, you start getting closer to the sharks. I took this shot, looking up towards the shark, after about 30 minutes spent in the water.